I'd like to thank my Mum, my Dad, my accountant, my publicist and, of course, Lisa. To stand before you now as Britain's leading drugs kingpin is both a thrill and an honour. Well ok, I haven't actually won anything, but I have been sent an entry form. 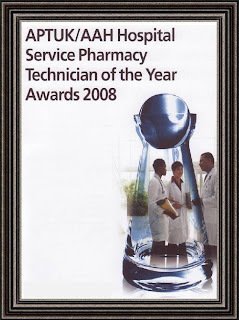 The closing date is 31st January 2009, so I'm just six months away from getting my hands on an engraved glass decanter. I can't wait. I need something to catch the drips from my leaky boiler. Anyhoo, it's been a busy three days at work. I've been given a pet Slovakian to train up into a successful Mini-Me, and frankly I'm knackered. But give it another week and I'll have my feet up on the desk while he does all the work. So far I've just taught him the essentials - where the kitchen is, and how I like my tea. I'll be moving on to cake-slicing on Monday. As it happens though, I have no time for work chat now. Lisa's elderly aunt was taken into hospital yesterday with some kind of infection, so we're off to visit her. She's in Egremont Ward, which is a bit of a concern. I packed their drugs for them this week, so if she's run out of medicine, it'll all be my fault.